A Co-op Visit to Red Hawk Farm! Lettuce is one of those foods we’ve come to take for granted in our daily lives. Side salads appear year-round on menus at almost every restaurant; a salad is often the healthiest lunch option we have when we’re on the go, or the perfect addition to a potluck meal; a sandwich or burger doesn’t feel complete without some crispy lettuce on top. Lettuce is healthy, delicious, and seemingly everywhere! But lettuce is also delicate, highly perishable, and a little bit fussy as veggies go. 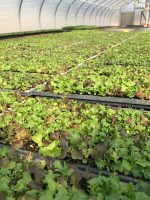 The reality is that in North Carolina, there are only a couple of windows of time in fall and spring when natural conditions are ideal for growing these leafy greens. Lettuce requires specific conditions to not only grow, but also taste great. And yet – somewhat miraculously – we are lucky enough to have delicious salad greens on the shelf at the Durham Co-op year round that come from right down the road at Red Hawk Farm! How does this magic happen? How are we so lucky to have these precious local greens available to us all months of the year? Turns out the magic is actually a ton of hard work, attention to detail, infrastructure, and expertise that Brett Evans and his team at Red Hawk Farm put into the farm every day. Meredith, Local Vendor Ambassador for our Marketing Team, and Cam, our Produce and Meat Manager, were lucky enough to visit the farm for a tour last month, and they got the full scoop on what it takes to steward these greens from seed to store during our coldest and hottest months in North Carolina. Brett Evans bought the land for Red Hawk Farm just three years ago in 2016. What began as raw land has transformed into 8 high-tunnels covering 1 acre of ground (with more in the works), and additional 2-3 acres of field in vegetable production. Growing greens year round requires a lot of infrastructure: a new farm needs a driveway, electricity, a well and waterlines for irrigation, and graded, level ground for construction of high tunnels and greenhouses. 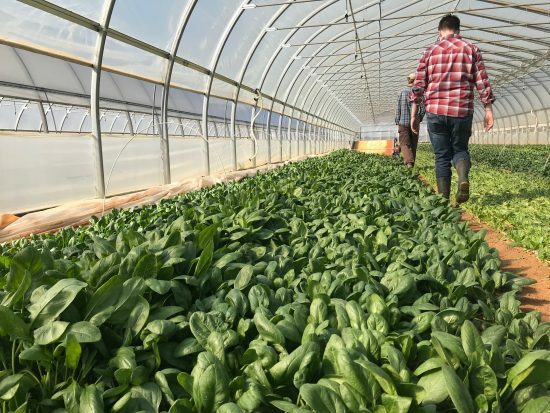 It’s amazing how quickly Brett has grown this business into the year-round, certified organic operation that Red Hawk Farm has become – they now supply thousands of bags of greens a week to restaurants, grocery stores, and local farmers markets! Needless to say, the Durham Co-op is proud to be one of their largest buyers! 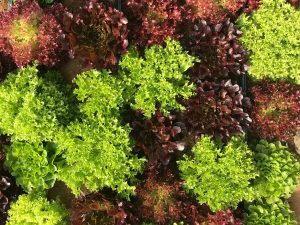 How do you grow lettuce during the winter in North Carolina, when the temperature is often below freezing? Winter growing is all about keeping things warm enough, from seeding until harvest. The life of your salad mix from Red Hawk Farm starts in a germination chamber (a converted cooler that also has heating capability), built specifically to keep seeds warm and humid enough to germinate during the cold months. Once the seeds germinate (sprout up out of the soil), they come out of the germination chamber and live in the greenhouse until they are big enough to transplant. After that, they still need lots of care to keep them warm enough to make it to your kitchen table in January! 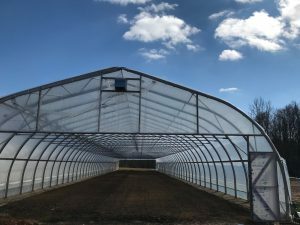 Unheated high-tunnels trap heat from the sun during daylight hours, but when the temperature gets below freezing at night, the plants also need to be protected with a fabric cover to keep them from freezing. Every leaf of winter salad that ends up on your dinner table has been grown with so much care and attention! If you think growing lettuce in winter sounds tricky, growing delicious lettuce in the heat of a North Carolina summer is practically a magic act. Lettuce gets stressed out in too much heat. It stops growing, and also doesn’t have good flavor or texture if it’s gotten too hot and stressed. Keeping the seeds and plants cool enough in the summer is an even greater challenge than keeping them warm enough in winter! Summer lettuce seeds begin their life in the same germination chambers that kept seeds warm enough in winter – but this time, they are repurposed to cool the soil down to 70 degrees until the lettuce seeds germinate. 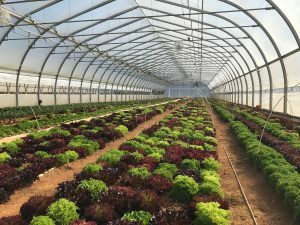 Once the lettuce is ready to plant, the trick is how to keep them cool in the same tunnels that kept them warm during winter. Shade cloth is put over the tunnels to drop the temperature, and multiple types of irrigation are needed to keep the greens not only well watered at their roots (with drip irrigation), but also cooled down so they don’t get stressed (overhead sprinklers). While we often think of vegetables growing faster the hotter it gets, for lettuce the opposite is true. Their growth slows down or stops at a certain temperature, and while winter greens can often be harvested multiple times and re-grow, summer lettuce can usually only be harvested once. 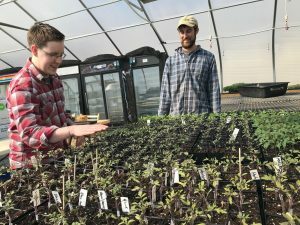 Our trip to Red Hawk Farm brought to light a lot of the challenges that local farms have to confront in order to meet the demand for local produce year round. At the DCM, we love buying local produce because it tastes great and it helps us live our core values in many ways. Supporting local farm businesses means supporting our local economy and supporting producers that are good for the environment. We also love buying from small business owners, like Brett, who are committed to providing a living wage to their workers. We’re incredibly proud to be supporting a farm like Red Hawk. We hope you look at your salad a little differently after hearing its origin story and take a moment to appreciate how much work Brett and his team have put into the leafy green goodness you get to enjoy!